4) Fowler, Mattie, age 5, neice, born NC, parents born NC. 5. Story. 3924 The first house where William and Jeanette lived was gone before Bob can remember. Aunt Alta made a painting of it, but no one knows what happened to the painting. Clint has tried to find it; he was able to find some of her other paintings, but not that one. 6. Story, 1890, Saxapahaw, Alamance County, North Carolina, United States. 1888 Prominent members of the founding group of the Saxapahaw Union Church, which later became Saxapahaw Methodist Church, were William F Lindley, Joseph D Bacon, and Nancy Teague. Saxapahaw Union Church was founded in 1890. 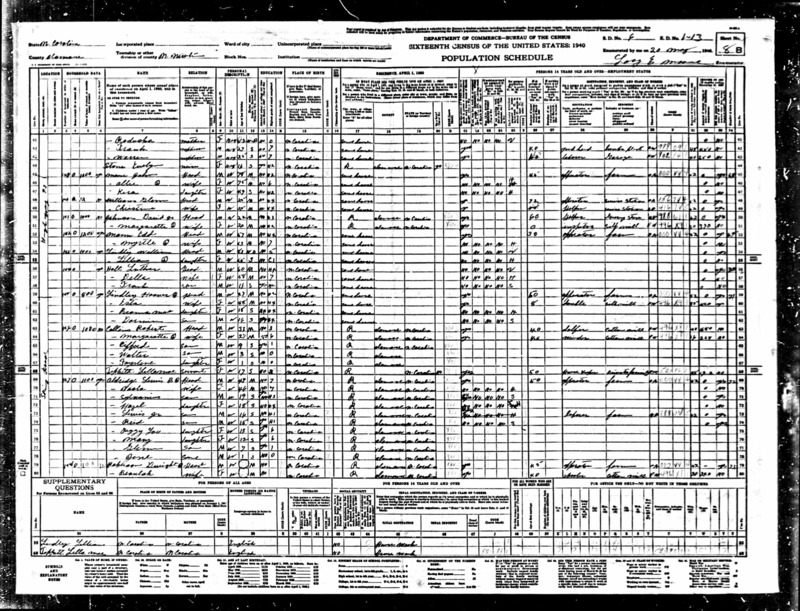 10) Lindley, Percy E., son, born May 1895, age 5, born NC, parents born NC. 7) Lindley, Percy, son, age 15, single, born NC, parents born NC, speaks English, farm laborer at home farm, can read and write, attends school. 10. Property: Bought 11 acres, 1 Nov 1913, Alamance County, North Carolina, United States. D M Moore and wife of Alamance Co sold to W F Lindley of Alamance Co, for $83, 11 acres in Newlin Twp adjoining Luther Holt, Ed Mann, D M Moore, W F Lindley, and a road. The land is between Lindley's existing land and Ed Mann's land, to the west of Lindley's existing property along the road. (Alamance Co Deed book 54, p166). 5) Lindley, Percy E., son, age 25, single, can read and write, born NC, parents born NC, no occupation. 15. Residence, 1928, Alamance County, North Carolina, United States. A map I have of Alamance Co, dated 1928, shows home of W F Lindley on SW side of main road. Neighbors are E W Mann to the NW on same side of road, and W L Holt across the road. There is a small road, labeled "Spring Church Road", going south from the main road to Spring Mtg. W F Lindley's home is at the corner of this road and the main road. 2) Lindley, Lillian, daughter, age 44, single, can read and write, born NC, parents born NC, no occupation. 19. Religion: Methodist, 1940, Saxapahaw, Alamance County, North Carolina, United States. 1883,3910 Was member of Saxapahaw Methodist Church. 20. Obituary, 7 May 1940. 3910 Burlington, May 7 -- William F. Lindley, 83, died ths morning at 10 o'clock at his home, route 2, Graham, following an illness of six weeks. A well-known farmer of the Moore's Chapel community, he was a native of Chatham county. He was a member of Saxapahaw Methodist church. Surviving are two daughters, Mrs. N. W. Mann and Miss Lillian Lindley, route 2, Graham; three sons, Charles C. Lindley, Burlington, H. H. Lindley, route 2, Graham, and Dr. P. E. Lindley, High Point; two sisters, Mrs. Joe Bacon, High Point, and Mrs. Sallie Bass, Burlington; 17 grandchildren and 11 great-grandchildren. Funeral service will be held Wednesday afternoon at 3 o'clock at Saxapahaw Methodist church. Burial will be in Moore's Chapel cemetery, Saxapahaw. 21. Obituary: Burlington Daily Times News, 7 May 1940, Burlington, Alamance County, North Carolina, United States. 2135 William F. Lindley, 83, died this morning at 10 o'clock at his home on Route 2, Graham, following an illness of 6 weeks. The deceased, a well-known farmer of the Moores Chapel community, was a native of Chatham county. He was the son of the late Mr. and Mrs. Wesley Lindley and the husband of the late Mrs. Janette Teague Lindley. He was a member of Saxapahaw Methodist church. 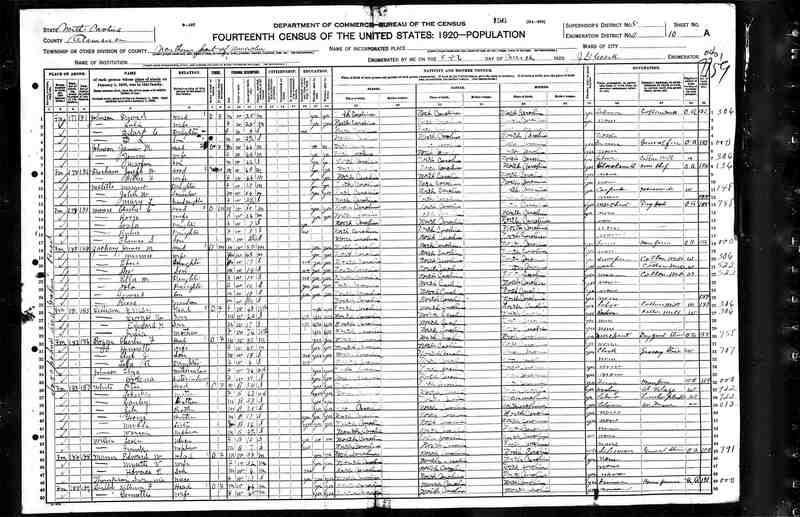 Surviving are two daughters, Mrs. E. W. Mann, and Miss Lillian Lindley, Route 2, Graham; 3 sons, C. Lindley, Burlington, H. H. Lindley, Route 2, Graham, and Dr. E. P. Lindley, High Point; 2 sisters, Mrs. Joe Baken, High Point, and Mrs Sallie Bass, Burlington; 17 grandchildren and 11 great grandchildren. 22. Residence, 7 May 1940, Graham, Alamance County, North Carolina, United States. 1881 William F. Lindley was resident of Rt. 2, Graham, Alamance Co, when he died 7 May 1940. 23. Funeral, 8 May 1940, Moore's Chapel Cemetery, Alamance County, North Carolina, United States. 1282,1850 Funeral services for William F. Lindley, 83, Route 2, Graham, who died Tuesday, were conducted yesterday afternoon at Saxapahaw Methodist church. Rev. Mc. C. Henderson, pastor of the church, assisted by the Rev. T. J. Whitehead, the Rev. J. C. Madison, the Rev. T. B. Hough and Dr. F. W. Paschal, officiated. Mrs. J. L. Mann, of Carrboro, sang a solo, and other music was by members of the church choir. Burial was in Moore's Chapel cemetery. Pallbearers, members of the Men's S. S. class of Saxapahaw Methodist church, were: W. O. Hackney, G. Parks Moore, J. M. Johnson, Lacy M. Starr, Claude H. Thompson and R. A. Stanford. Flower-bearers were granddaughters and grandsons, with Mrs. Luther Holt in charge. They were: Mesdames Claribel Cates, Hugh Foster, Mary Young, Frances Craddock and Banks Bass and Misses Brona May Lindley, Laura Marlette, Frances Lindley and Rachel Thompson and Hugh Foster, Melvin Lowe, Bill Lindley, Horace Mann, Desmond Thompson, Darwin Lindley, John Lindley, Willie Lindley and Harvey Lindley. List of relatives who attended the funeral: Mrs. Sallie Bass, Mrs. Oscar Bass, Mr & Mrs Willie Lindley, Mr & Mrs Harvey Lindley, Mr & Mrs Will Coble, Mrs Currie Isley, Mr & Mrs Hugh Foster, Mr & Mrs Floy Rogers, Earl Workman, Georgia Workman, Mr & Mrs O. C. Workman, Fern Workman, Nancy Lee Workman, Mr & Mrs Harvey Newlin, Fleda McPherson, Elliotte Lindley, Mr & Mrs S. M. Alexander, Mr & Mrs R. W Lindley, Mr & Mrs J. Webb Lindley, W. H. Marlette, Lonnie Thompson, John Lindley Jr., Frances Lindley, Mr & Mrs Melvin Lowe, Mr & Mrs Edgar Thompson, Ed Thompson, Desmond Thompson, Mrs Ollie Bacon Pope, Worth Bacon, Mrs S. T. Webster, Mr & Mrs S. E. Ausley, Mr & Mrs A. G. Ausley, Mr & Mrs Horace Mann, Mr & Mrs G. N. Guthrie, J. H. Guthrie, Byron Guthrie. 2. Lindley, Lillian, daughter, age 55, single, completed 1 year of college, born NC, engaged in home housework, earned $0 in 1939, received no other income, father born NC, mother born NC, English spoken in home in earliest childhood, does not have a Social Security number, usual occupation house work. Information was provided by Lillian. 25. 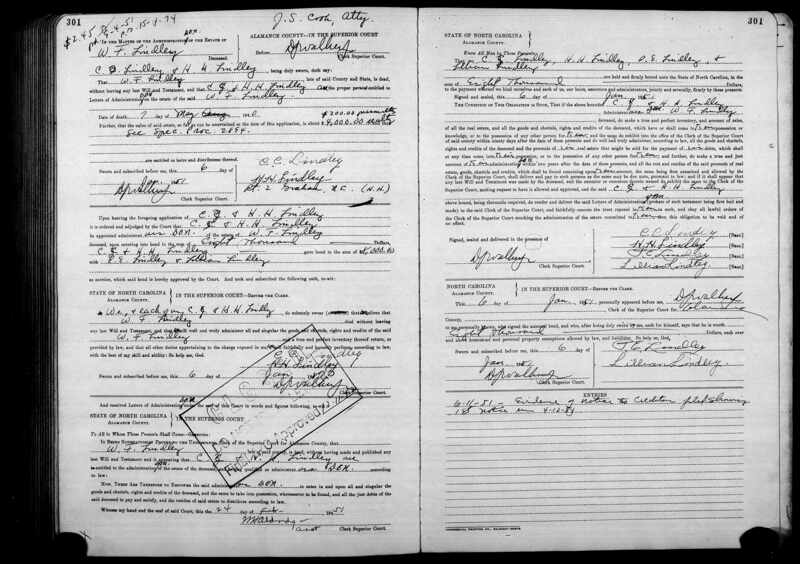 Appearance in Document: Death Certificate, 23 May 1940, Alamance County, North Carolina, United States. 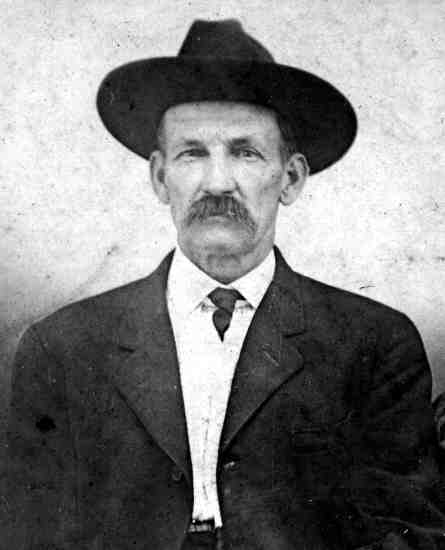 1881 Full Name William F. Lindley; widowed; husband of Janette Teague Lindley; home of deceased R.F.D. 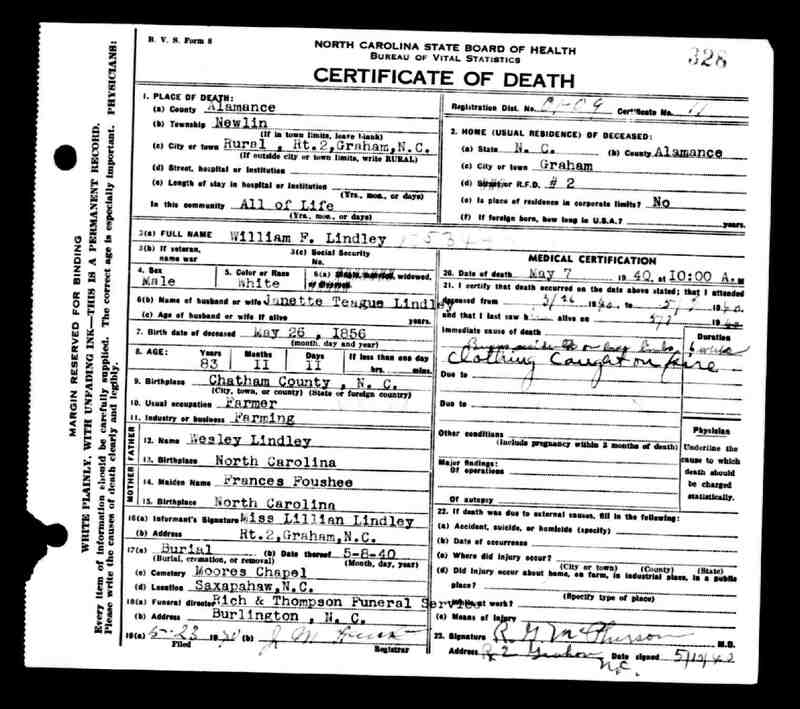 #2, Graham, Alamance County, NC; date of death 7 May 1940; place of death rural area, Rt. 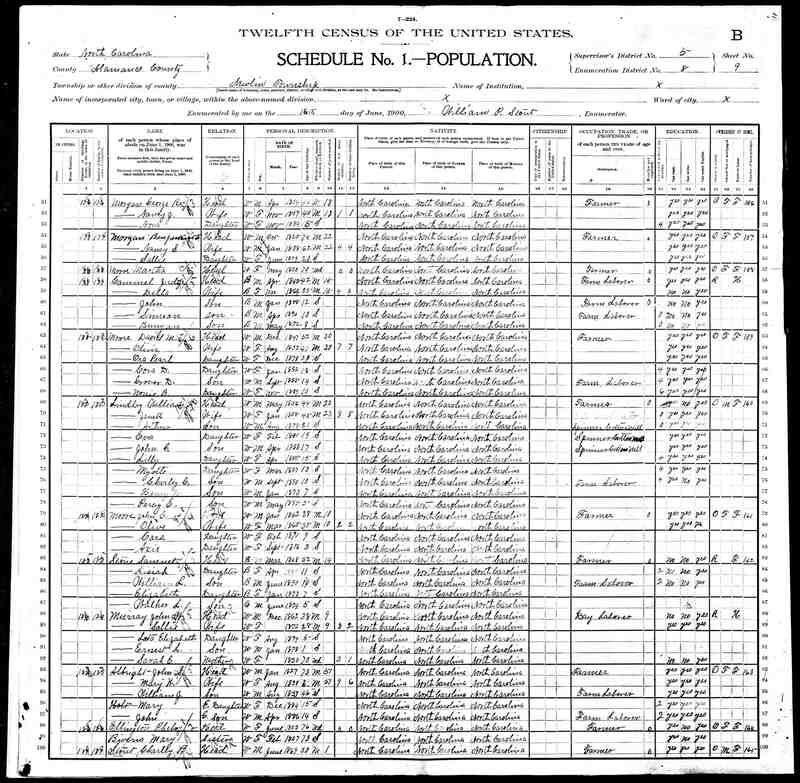 2, Graham, Newlin Township, Alamance County, NC; birth date of deceased May 26 1856; age 83 yrs, 11 months, 11 days; birthplace Chatham County, NC; usual occupation farmer; father Wesley Lindley, birthplace NC; mother Frances Foushee, birthplace NC; informant Miss Lillian Lindley, Rt. 2 Graham NC; buried at Moores Chapel cemetery in Saxapahaw, NC; attended by doctor from 3/26/1940 to 5/7/1940, died of "burns accident on large limbs, clothing caught on fire", duration 6 wks. 26. Obituary, May 1940. 1883 William F. Lindley, 83, died Tuesday morning at 10 o'clock at his home on Route 2, Graham following an illness of 6 weeks. 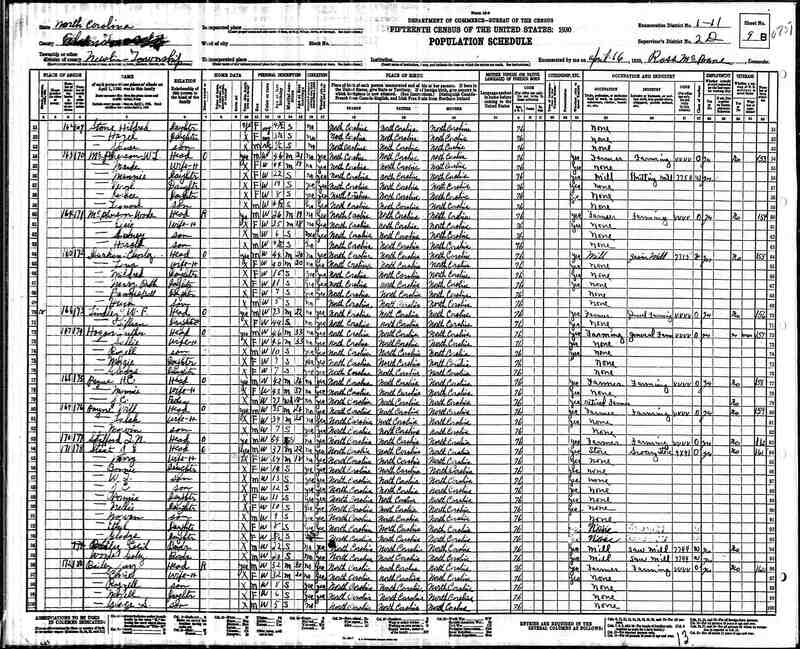 Surviving are two daughters, Mrs. E. W. Mann, and Miss Lillian Lindley, Route 2, Graham; 3 sons, C. Lindley, Burlington, H. H. Lindley, Route 2, Graham, and Dr. E. P. Lindley, High Point; 2 sisters, Mrs. Joe Baken High Point, and Mrs. Sallie Bass Burlington; 17 grandchildren and 11 great grandchildren. 27. 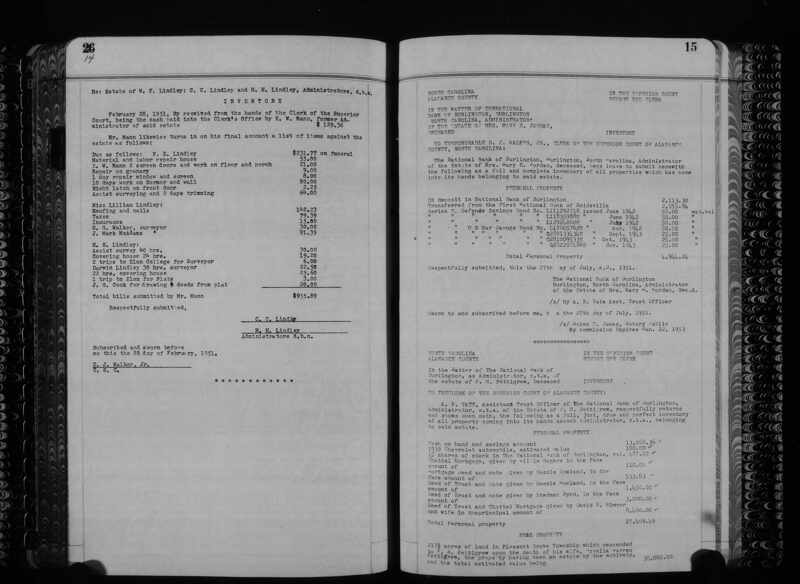 Probate: Record of Administrators, 3 Sep 1949, Alamance County, North Carolina, United States. 1863 Record of Administrators states W. F. Lindley died May 1940, without a will, and names E. W. Mann as administrator. It estimates value of estate at $4000 realty and $100 personalty. 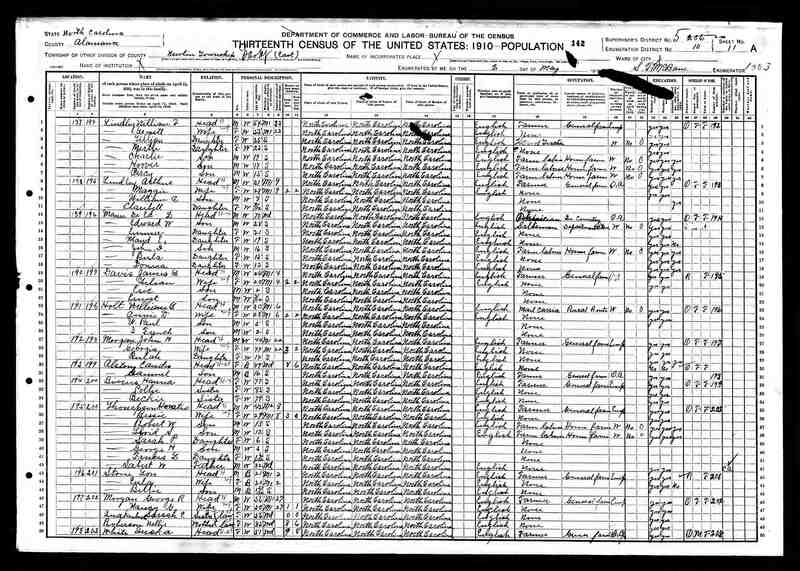 Identifies the heirs as children: C. C. Lindley (of Chapel Hill), Lillian Lindley (of Mebane), Myrtle L Mann (crossed out, and replaced by Horace E. Mann (of 811 Central Av., Burlington), grandson), H. H. Lindley (of Mebane), P. E. Lindley (of High Point); grandchildren: Bill Lindley (of Mebane), Clarabel L. Cates (of Mebane), Swannie T. Foster (of Mebane), Lonnie Thompson (of Altamahaw), Coy Thompson (of Glen Raven), Maggie T. Lowe (of Glen Raven), Edgar Thompson (of Glen Raven), Eliot Lindley (of Charlotte), Jack Lindley (of Charlotte), Malcolm Lindley (of Charlotte), John Lindley (of Charlotte), and Frances Lindley (of Charlotte). [Note that grandson Horace E. Mann was added to the list later, after Myrtle L. Mann died.] E. W. Mann, H. H. Lindley, and Lillian Lindley posted $200 bond. Information was sworn to on 3 Sept 1949. 28. Will: Died without will, 3 Sep 1949, Alamance County, North Carolina, United States. 1863 Record of Administrators states W. F. Lindley died May 1940, without a will. Household and kitchen furniture estimated $100.00, Farming tools $20.00, Real estate estimated $1000.00. 30. 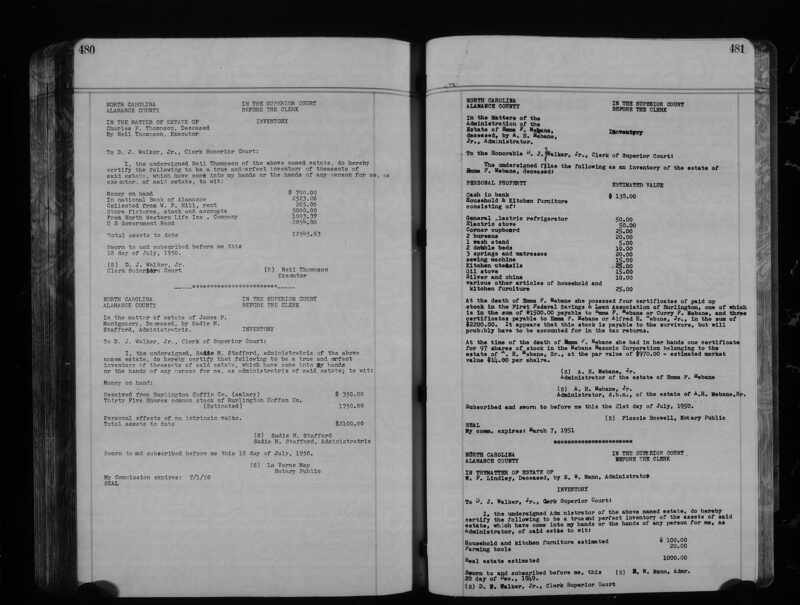 Probate: Settlement of Estate, 19 Sep 1950, Alamance County, North Carolina, United States. 3926 Final Account of estate of W. F. Lindley, submitted 19 Sept 1950 by E. W. Mann, administrator, defines money expended to resolve the estate. 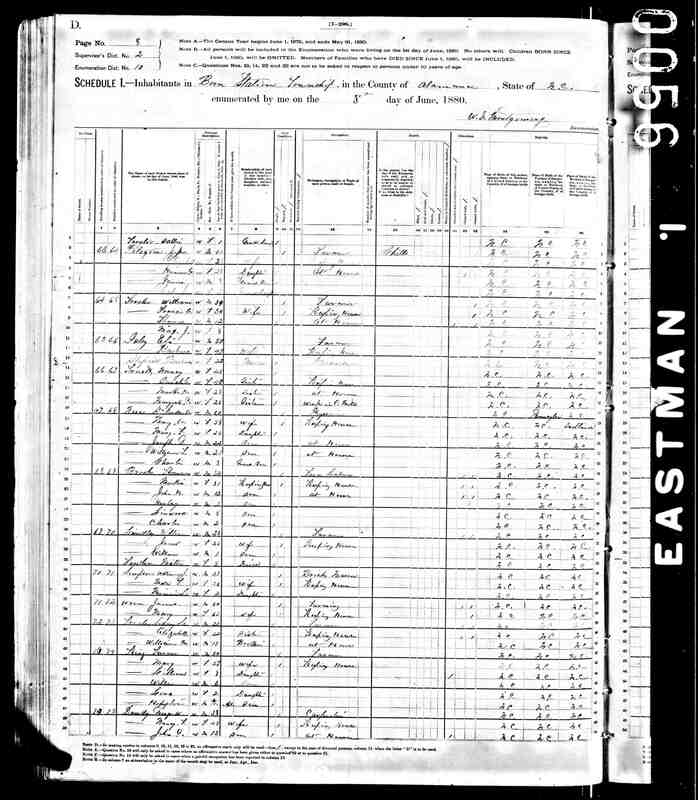 E. W. Mann submits his resignation as administrator, and lists expenses still unresolved, including funeral expenses, materials and labor to repair the house, surveying, taxes, and insurance. 31. 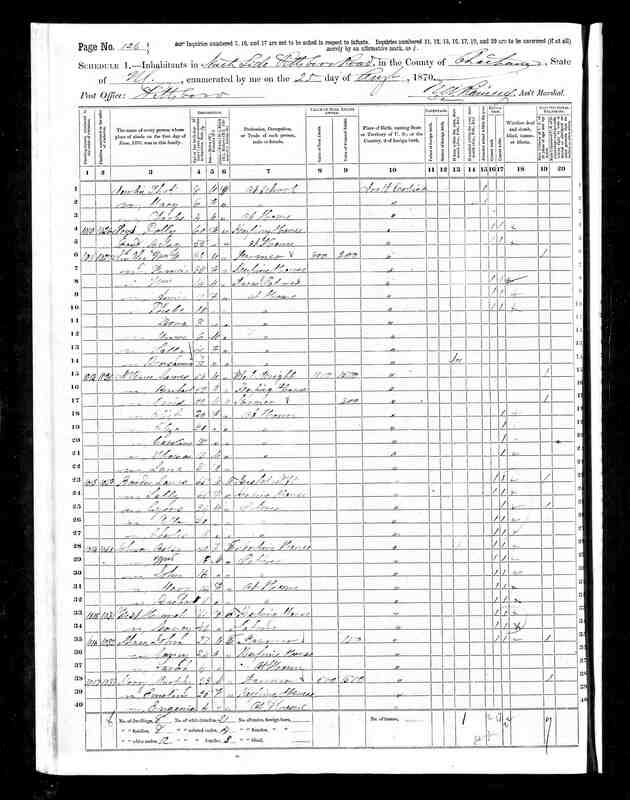 Probate: Administrator Record, 6 Jan 1951, Alamance County, North Carolina, United States. 1882 A second Record of Administrators states W. F. Lindley died 7 May 1940, without a will, and names C. C. Lindley and H. H. Lindley as administrators. It estimates value of estate at $4000 realty and $200 personalty. C. C. Lindley, H. H. Lindley, P. E. Lindley, and Lillian Lindley posted $8000 bond. Information was sworn to on 6 Jan 1951. 32. 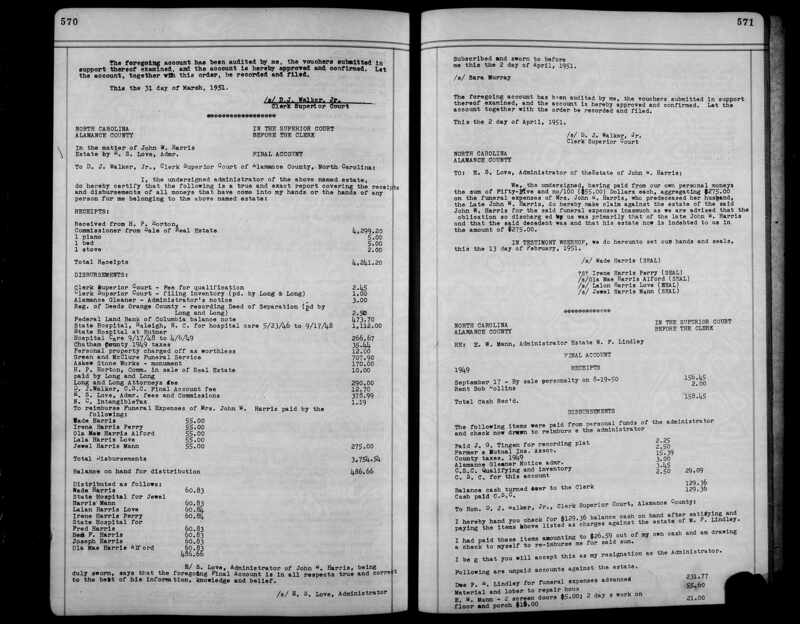 Probate: Inventory of Estate, 28 Feb 1951, Alamance County, North Carolina, United States. 3927 Inventory of Estate for W. F. Lindley, submitted Feb 28 1951 by C. C. Lindley and H. H. Lindley, administrators, reports the accounts provided by E. W. Mann, former administrator of the estate. This inventory defines money expended to resolve the estate, including funeral expenses, materials and labor to repair the house, surveying, taxes, and insurance. 33. Story. 3924 Ed Mann lived at the south corner of what is now Rt 87 and the road to Moore's Chapel Cemetery. His store was on the east corner. There were homemade tennis courts located in between Ed Mann's house and William F Lindley's house. Continuing SE along Rt 87, we reach a crossroads with another road to Saxapahaw. If we turn right onto that road, we reach Hoover Lindley's house on the right. Continuing along that road, we cross a creek (this is the creek that was dammed to create the waterworks), then reach a site on the left that was purchased by Perce Lindley, but he never moved there. Backtracking to Rt 87, if we continue SE along Rt 87, we reach the home of William Amick Lindley on the right, now the home of Billy Lee Lindley. Across Rt 87 from Billy Lee's house is the home of William Arthur Lindley. Further down Rt 87, on the NE side of the road, is the site of William F Lindley's first home. Bob believes Perce bought this also, but is unsure what happened to it. Retracing steps back to Ed Mann's store, there is a road along Rt 87 SE of the store that goes towards Saxapahaw. Ed Thompson and wife Eva (Lindley) lived along that road, and perhaps Cora Lindley, widow of James Monroe Lindley, also lived along that road. Perhaps Cora lived in a home that was purchased for her by Lillian. 35. Story. 816,3924 He was a farmer. Had a moustache, smoked a pipe. Made footballs out of pig bladders. Was a stern disiplinarian. Did not allow speaking at the dinner table. Was hard of hearing, so when sons Charles and P.E. built a crystal radio and picked up a Philadelphia station, he did not believe them. 36. Story. 816 Had a half acre pond on the property with a dam that was used to generate electricity. Once electricity was run to the property by the utility company, the pond was allowed to drain dry. [Robert H Lindley believes the electricity was at Hoover Lindley's, not W F Lindley's, and was built by Charles, Perce, and Hoover. The dam was made of wood.] He felt that the dinner table was a place for eating, not for conversation. When he was ready to eat, he would go to the table, say the blessing, and begin, whether or not anyone else was there. 37. Story. 3928 The dam was broken throuth and the pond drained after complaints from a neighbor (Moore) that the water was backing up onto his farmland. 38. Story. 816 He used to sit close to the fire to keep warm, and one time his blanket caught fire, burning his legs. Gladys Haywood Lindley sat with him until he recovered. 39. Story. 3924 His yard was kept clear of vegetation ("skint"). This reduced yard maintenance, and also kept it clear of snakes. He had his own forge and bellows, so he probably shoed his own horses (Hoover had his shoed by a travelling blacksmith). Robert H Lindley has a few items that were made in the forge. 40. Story. 3924 William's second house had a parlor, but also a main room with a fireplace which is where the family would sit when visiting, and where William slept. It had a dining room, kitchen, another room (where furniture was stored later), and two bedrooms upstairs. His daughter Lillian slept there at first while William was alive. At some point, they added a chemical toilet to the house, but maybe nobody used it but William so he would not have to go outside. Otherwise, people used the outhouse. There was a long porch that went the length of the day room and kitchen. There was a bucket of water from the well there, and a basin for washing. There was a cream separator there, probably used by his son Hoover since Hoover kept his milk in the "spring house" (really the well house) to keep it cool, so it would have been a convenient place to use it. The porch was screened. There was a gutter on the edge of the porch roof that caught rain water and fed it into a barrel for use with washing and bathing. Wells were hand-dug, so they were not very satisfactory. It took two people to dig the well; one to dig, one to draw the dirt out. The well was located next to the spring house. When you drew water at the well, any extra water went into a trough that flowed into the spring house and kept the water available for use. 41. Story. I have photo of William by himself, standing by a river. Another photo shows people playing golf on his land. Another photo shows William, wife Jenette, Hoover, Perce, and three younger women, probably Eva, Lillian, and Myrtle. I have a portrait photo of William and Jennette. 42. Story. Not sure about middle name. Could be Forshee or Foushee. 43. Property: Alamance County, North Carolina, United States. Mortgage Deed from Wm F Lindley and Lucinda Lindley to Samuel E Woody, trustee, Alamance Co Deed book 24, p343. Marked "cancelled" in deed book. 44. Property: Alamance County, North Carolina, United States. Mortgage Deed from Wm F Lindley and Lucinda Lindley to D M Moore, Alamance Co Deed book 60, p454, according to deed index, but I could not find it in the deed book. Marked "cancelled" in the index. 45. Property: Alamance County, North Carolina, United States. Mortgage Deed from Wm and Jennett Lindley to George W Stockard, Alamance Co Deed book 37, p346, according to deed index, but I could not find it in the deed book. Marked "cancelled" in the index. 46. Appearance in Document: Alamance County, North Carolina, United States. Listed in Alamance Co Death Index, book 28, p325. 1. 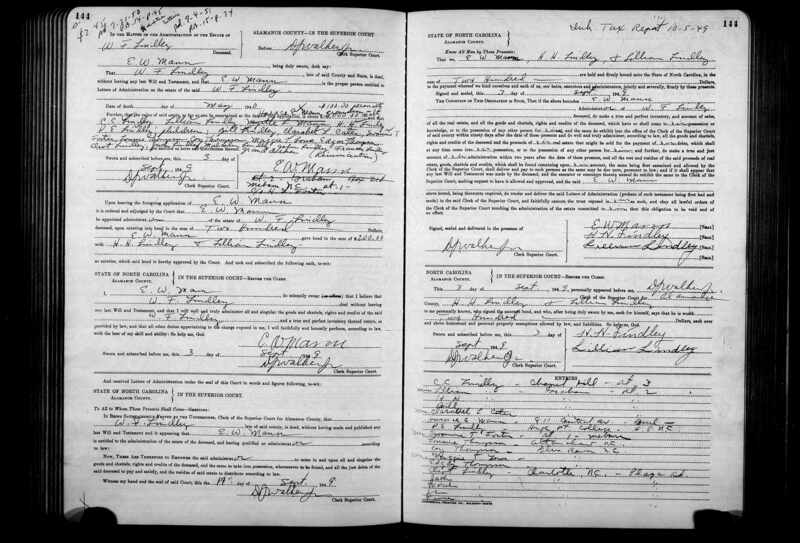 Marriage, 27 Jun 1877, Mebanesville Twp, Alamance County, North Carolina, United States. 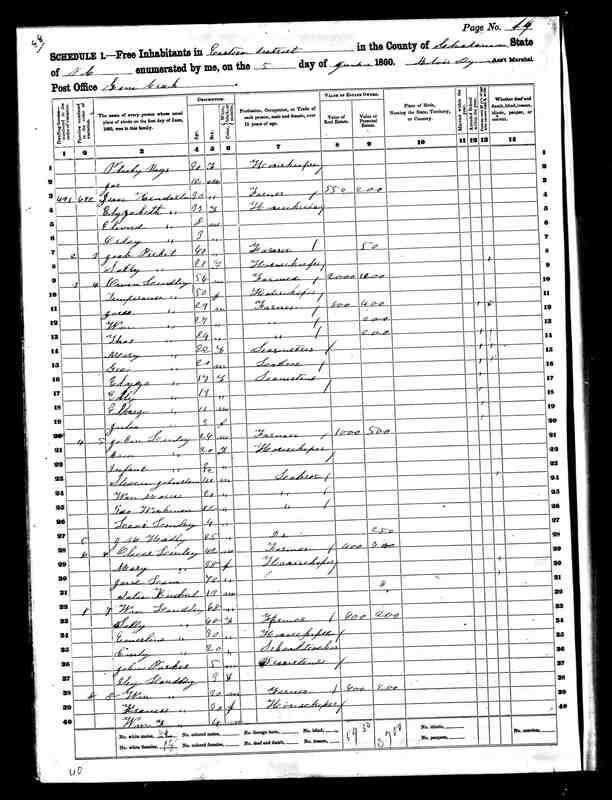 3354 William F. Lindley, age 21, born 1856, son of William W. Lindley and Frances B. Lindley, married Jannett Teague, age 22, born 1855, daughter of Isaiah Teague and Nancy Teague.